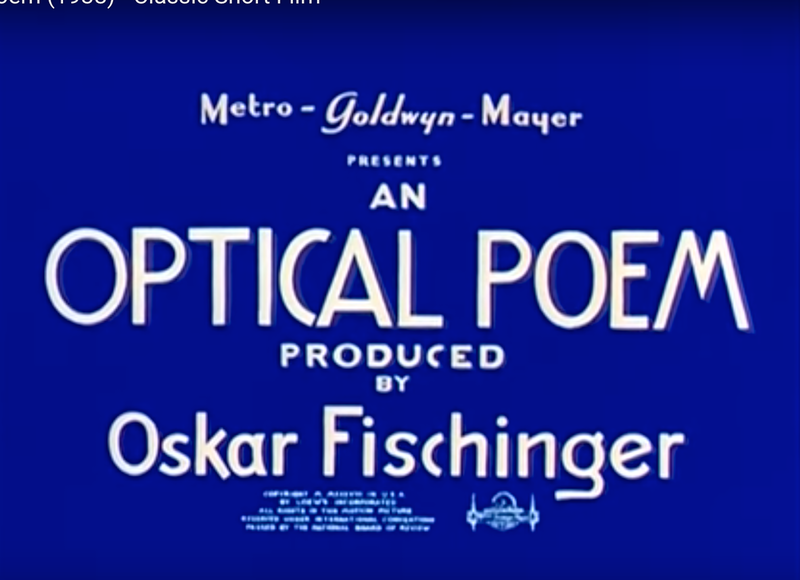 Oskar Fischinger's short film, "An Optical Poem," was released by MGM in February of 1938, and that was that. Or not. 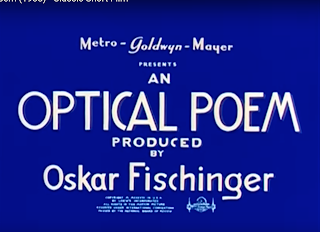 There was no studio with more prestige or box office power in the late 1930s than Metro-Goldwyn-Mayer, but it was lagging in two crucial lucrative markets: short films and cartoons. Stung by the continuing success, and innovations, coming out of the Walt Disney Studios, MGM wanted to get in those spaces. In the busy year of 1937, MGM launched an in-house magazine called "MGM Short Stories" to promote its renewed commitment to these genres. This glossy was distributed to Loews theater owners and theater managers each month in order to provide background on the short films and cartoons MGM would be releasing, as well as recommendations on how these films could be promoted to boost their box office potential. The studio had also hired two men, Hugh Harman and Rudolph Ising, to lead a reinvigorated short film department. Fred Quimby was overseeing the animation unit. 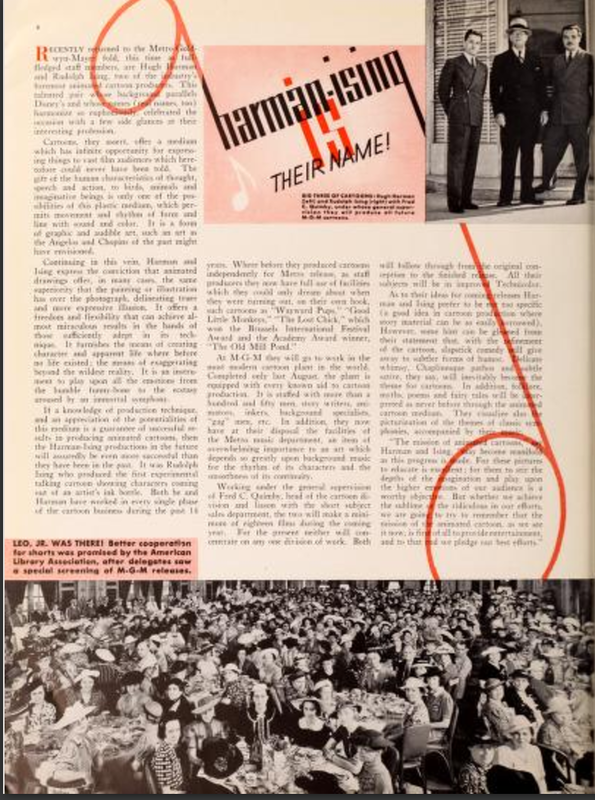 The October/November 1938 issue of “MGM Short Story” included a profile of Harman and Ising titled “Harman and Ising Is Their Name.” The unsigned piece announced the studio’s intentions and aspirations. “Cartoons... offer a medium which has infinite opportunity for expressing things to vast film audiences which heretofore could never have been told. The gift of the human characteristics of thought, speech and action, to birds, animals and imaginative beings is only one of the possibilities of this plastic medium, which permits movement and rhythm of form and line with sound and color. It is a form of graphic and audible art, such an art as the Michelangelos and Chopins of the past might have envisioned,” the article states. To emphasize what Ising and Harman felt animation could do, they turned to an unlikely source: little known abstract German filmmaker Oskar Fischinger. Fischinger, born in 1900, had been making films since the 1920s, had pioneered multi-projector film pieces that also integrated music, and had worked on some special effects for Fritz Lang's 1929 film, "Women in the Moon." He came to Hollywood in 1936, at first with Paramount, and then with MGM. 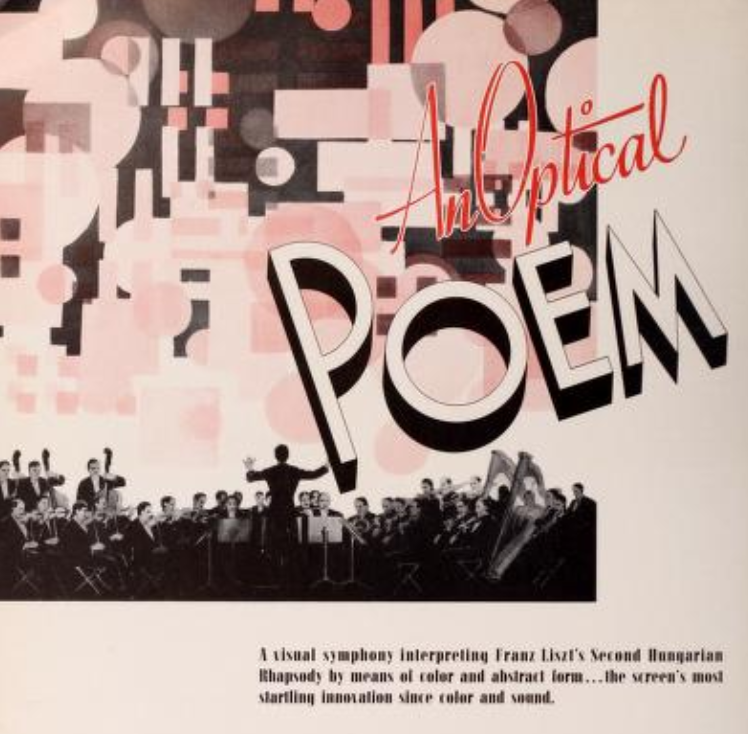 His first, and turns out only, commissioned piece for MGM was called “An Optical Poem." MGM positioned this seven-minute film as the gold standard of what animation could do; something even more innovative, or startling, than what was coming out of the Walt Disney Studio. Disney could make animals talk, but MGM was after something more daring than that. 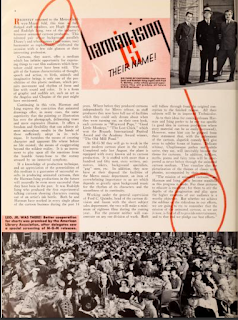 In the March 1938 edition of “MGM Short Story,” the PR department previewed “An Optical Poem.” The article is reprinted here almost in its entirety, perhaps for the first time since it was published 80 years ago, and sheds light on just how important the studio felt the film was to its image. “To meet the present clamor for something new on the screen, Hollywood comes forward with the most startling innovation since the advent of sound and color. 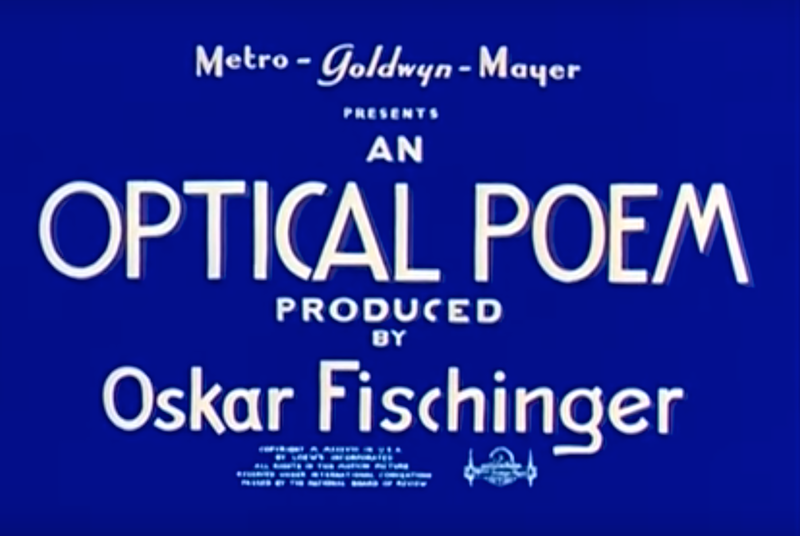 Abstract motion pictures is the answer, as supplied by 'An Optical Poem,' produced by Oskar Fischinger for Metro-Goldwyn-Mayer. “Described as the first example of the 'absolute' in motion pictures, the production is heralded as the beginning of a new art form which is to the eye what music is to the ear. “Using nothing but geometrical figures in color — circles, squares, triangles — and synchronizing them in movement with the strains of Franz Liszt's 'Second Hungarian Rhapsody,' Fischinger achieves a visual symphony that is tantamount to a poem. 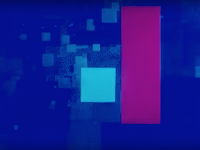 “So, Fischinger has painted a visual symphony. Dots swell into great circles of color and burst upon the audience with a third dimensional effect that builds the emotions as does the blare of the trumpet that is heard. Shutters of light fall into an orchestral frenzy as the volume of sound increases. Chords break into pale cascades and rumbling base tones roll across the screen like great balls of fire. They are absolute images of space and time, sprung directly from the music, but in themselves creative and provocative. “Fischinger displays such a complete sense of visual, as well as aural, imagery that it is easy to believe that even without the strains of 'Lizst's Rhapsody' as a background one well could experience the emotions provoked by the music if it were not there. An instinctive appreciation of weights and volumes and a nice sense of fun make the screen live with all shades of emotion, although there is nothing passing across it but the abstract. It is almost impossible to put into words the curious mixture of shock and satisfaction evoked. “Artists and musicians who have seen 'An Optical Poem' say that it is the greatest proof yet offered that the two arts are closely related. Two mediums, one aural and the other visual, live in rhythm, melody, harmony, color and an amazingly precise arrangement of movement. Appealing to two senses, they combine to achieve a singularly similar effect upon the audience, which senses the perfect balance, and physical sensation that results from the combination. 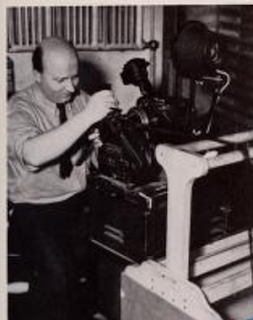 Fischinger at work, as published in "MGM Short Story"
Fischinger worked for six months to perfect ‘An Optical Poem,’ his first picture for Metro-Goldwyn-Mayer. He alone constitutes his entire production force, being artist, set designer, cameraman and cutter. In fact, he's the whole show, without even a human face on the screen. 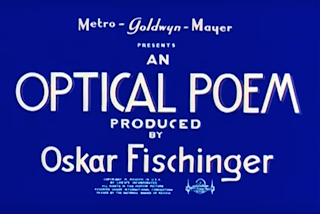 A still from "An Optical Poem"
In a bit of unhappy irony, Fischinger was hired to work on the famousToccata and Fugue in D Minor (Bach) segment in “Fantasia,” but he would later claim that the final version bore little relation to his own work. When it was released in 1940, the ad campaign for “Fantasia” used a tagline, “Hear the pictures! See the music!” It was a page right out of the MGM playbook. “Fantasia” flopped, at first, and after 1940 the world had little time for the personal excesses of experimental filmmaking. Fischinger went on to a long career in abstract canvas painting, and died in 1967 at the age of 66. The kind of tonal and visual films he helped pioneer stayed quiet until the genre was revived int the 1960s by such filmmakers as John Whitney. 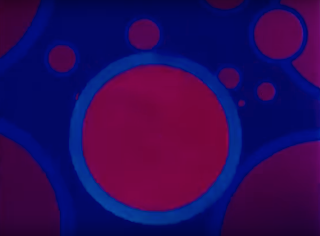 But maybe Fischinger was not completely forgotten after all. Thirty years after the release of "An Optical Poem," another forward-looking MGM film was released, and there are some visual clues that Stanley Kubrick may have had at least a passing knowledge of his esteemed predecessor while he was making "2001: A Space Odyssey."